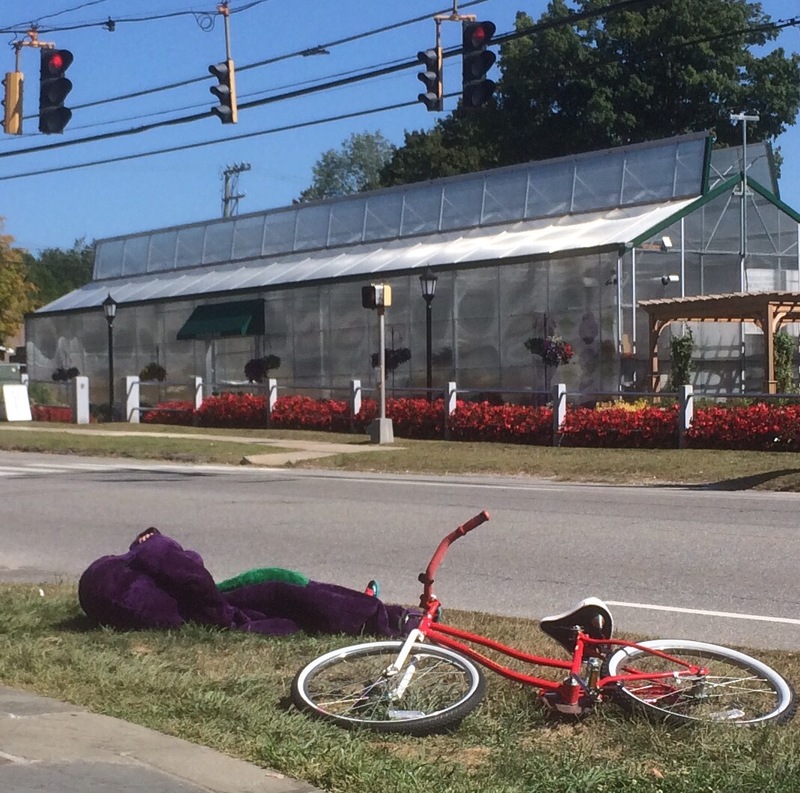 Barney, The Purple Dinosaur, beloved by children and despised by parents around the world, died in front of an ice cream shop on Sunday. He was twenty-three years old when he passed away. Though millions of adults had fantasized about bringing about the demise of this relentlessly positive metro-sexual Tyrannosaurus Rex for each of his twenty-three years, Barney’s passing appeared to be from natural causes. Witnesses on the scene reported that Barney seemed fine, waving at cars in front of the ice cream shop that hired him under the misguided impression that his presence would draw more customers. Barney was heard to remark on the heat just before he fell backward. Original reports from the scene stated that Barney had been struck by, or fallen from, a bicycle found near the spot he fell. Those reports were later discounted by police, whose investigation was hampered by witnesses who could not stop giggling about what they’d seen. Barney rose to prominence in 1992 as the lead character in the eponymously named “Barney and Friends” television show on PBS. His repetitive message of unconditional love, reinforced by the droning song “I Love You” gained him legions of little fans around the world. “I Love You” was so brutal it was used by interrogators at Guantanamo Bay and to inflict stress on Iraqi prisoners-of-war. Over 100 children appeared as cast members on the show including Selena Gomez and Demi Lovato, who appeared together for two seasons. Barney’s show was a hit in countries like Japan, where it was known as バーニーと英語であそぼう！(Bānī to Eigo de asobō!) and Israel, where they called it החברים של ברני (Hachaverim shel Barney). The show and its star drove parents mad in whatever language his show was aired in. When the show ended in 2009, Barney began a downward spiral. There were rumors of financial trouble and substance abuse as he struggled to deal with his fall from fortune. For a few years he was linked socially to other falling stars like Justin Bieber and Lindsay Lohan. Eventually, his star sunk low enough that he struggled to get the attention of that sort of B-list celebrity. While he supported himself by appearing at children’s parties and at business openings, the dinosaur remained hopeful that he would some day make a comeback. At his lowest, he’d tell anyone who’d listen that he would make it back and he’d remember those who hastened his fall from the top. Barney was working outside an ice cream shop when he was stricken. Several patrons were seated nearby when he fell, but none went to his aid. Later, some would compare the scene to seeing a mime fall; they didn’t know if the fall was part of the act or if he was really in trouble. Either way, it was the only time they’d been entertained by the character. Barney The Dinosaur is survived by his friends Baby Bop and her brother, BJ. A private memorial service will be held. Smart move with a private memorial because I think people would be compelled to break into a chorus of “Ding Dong the Witch is Dead” and I think that would be tacky. Yeah, taunting is so unwelcome at a funeral, but somehow appropriate here. It all gives new meaning to “the color purple,” doesn’t it? Comparison to a mime falling…brilliant! Well, thank you. But really, who likes a mime? Even their parents avoid them. Well, probably because of not seeing how to get into those boxes they are always trapped in…but I agree. I thought it would have taken an asteroid. Another theory shot. He was cockroach like in that way. All of his kind were wiped out, and yet he survived. Heat stroke got him. I read this hoping you were talking about my ex. It’s not. I’ll write a faux-eulogy for your ex. So what you are telling me is that there was a blessing to the heat wave that almost suffocated me and has California and parts of British Columbia on fire. I like silver linings. …Even when they are purple.